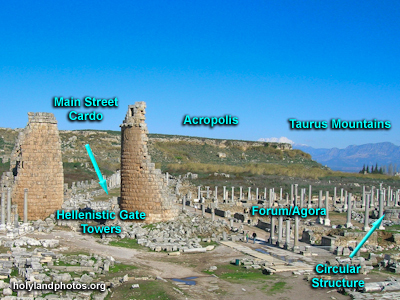 View looking north with the Hellenistic Gate on the left (west) side of the image with some of the columns of the long main street visible between the towers. On the right (east) side of the image the Forum/Agora is visible. In the left background is the acropolis of Perga and in the right background are the Taurus Mountains.